The NISOA Executive Council has approved a new referee badge (or patch, if you prefer). 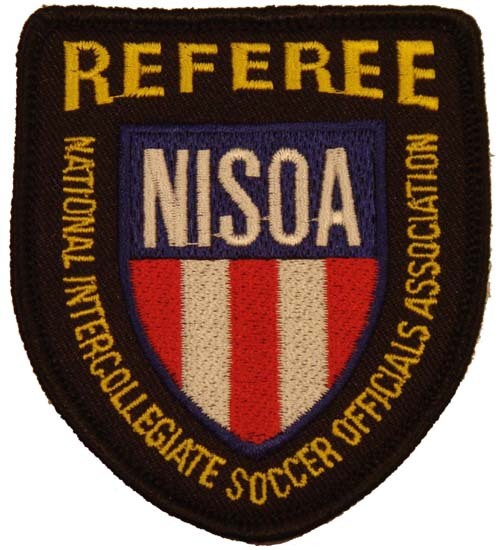 This badge is to be worn by all officials (except for NISOA National Referees) for all intercollegiate competitions unless otherwise specified by the governing sports authority, effective immediately. NISOA is distributing the badges by mail. We plan on ordering additional badges for member purchase before the annual rules interpretation meeting. This entry was posted on Friday, March 16th, 2007 at 6:46 pm and is filed under General with keyword(s) uniform. You can follow any comments to this entry through the RSS 2.0 feed. Both comments and pings are currently closed. I”ve not received a new badge, tho it seems everyone I’ve spoken to has gotten theirs. Can you send me one,please? We will contact NISOA and find out what happened. We will also place an order so we have extras on hand. I’ve been in touch with Mario Donnangelo re the badge situation. He posted a list of officials who had not received badges because of (what he says) incorrect address information. The NY Metro chapter listed only two officials — you were not on the list. I challenged Mario Donnangelo’s accuracy of information, which is based on the registration form NISOA sends to chapter contacts each year which is created by — Mario Donnangelo. I pointed out the fact that some officials in the NY Metro chapter did not receive the new badges, and their mailing addresses are correct. He’s looking into it. In the meantime, I will have a supply of the new patches before the start of the season. Most members opt for having more than one patch.